A men’s athletic fit v-neck top features a chest pocket with grommet detail, front welt pockets with triple-needle topstitching, front and back yokes, and stretch rib knit back panels for extra comfort. Center back length: 29½”. A long sleeved, crew neck knit tee features sleeves with thumbholes to keep hands warm, a stylized back yoke and flat-lock seam detail. Center back length: 27". 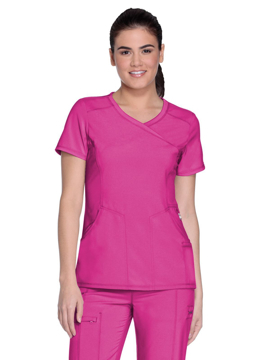 This consultation lab coat features a notched collar and a three front button closure. Also featured is one chest pocket and two lower patch pockets. Front and back darts for shaping. Center back length: 28".